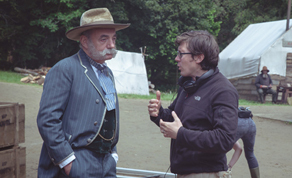 IFTN speaks to director and creator of ‘An Klondike’ Dathaí Keane about creating the much anticipated second season of the IFTA award winning Best Drama Series and the challenges associated with the expansion of production scale and character storylines. ‘An Klondike’ the Irish speaking western drama series, returns for its second season starting Wednesday 1st February on TG4 at 9.30pm. We shall see the new series pick up a few weeks after the climactic events that brought the first season to a close and continue the story of the Connolly brothers (played by Owen McDonnell, Dara Devaney, and Seán T. O’Meallaigh) as they struggle to forge an empire for themselves during the Klondike gold rush of the 1890’s. IFTN: How did it feel to have ‘An Klondike’ win an IFTA for Best Drama in 2016? IFTN: How has the series progressed from Season 1 in terms of its production scale & crew? Dathaí: “Logistically this season was a lot more challenging to shoot than the first one. We had more action scenes, more scenes on horseback, and the town of Dominion has grown since the first season. So there was definitely more involved in terms of stunts and SFX. “In the third episode of the new season the town of Dominion is hit by a raging storm and when we were writing the scripts I knew that we were creating potential headaches for ourselves by making this big set-piece such a pivotal part of the story. Throughout the prep, and even during the shoot, our plans for the storm sequence were constantly evolving. But that’s part of the process on a production like this – everyone involved brings their expertise to the table and between us we figured it out. 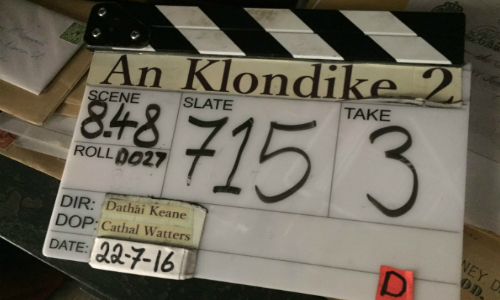 IFTN: From your own perspective can you describe what it’s been like to be involved in the creation & directing process of ‘An Klondike’ Season 2? Dathaí: “David Lynch has this wonderful phrase when it comes to film-making: ‘Enjoy the doing’. That’s great advice. I first pitched ‘An Klondike’ to TG4 back in early 2011 so some part of my mind has been occupied with this show for the past six years. What we have achieved with the second season really feels like a culmination of all that work. Marcus Fleming wrote amazing scripts, we had a great cast and crew, and we really hit the ground running when it came to the shoot. “In terms of the actual directing of the new episodes, I wanted to approach the material with a more fluid style that would place more emphasis on telling the story visually. On the first season, my approach was more diagrammatic, everything was shot-listed and planned in advance. IFTN: Can you tell us what viewers can expect from ‘An Klondike’ Season 2? Expansion of storylines, new characters, lots of action/drama? Dathaí: “In the first season we were telling a more linear story that revolved around the Connolly’s getting to Dominion and establishing themselves in the town. This time round we knew we didn’t want to tell the same story again. Marcus Fleming and I talked a lot about what we wanted to explore next and how the events of the first season would affect the various characters and how it would change them. “We left some major dangling threads at the end of the first season that propels the action across these new episodes and allows us to really get under the skin of the Connolly brothers. The relationship between the brothers is the emotional centre of the story and we wanted to explore the impact that a town like Dominion, where civilisation hangs by a thread, has on them. Their old world of Irish tradition, family and God is gradually replaced by this New World - a world where all those values are lost. ‘An Klondike’ returns for its second season airing on TG4 from Wednesday 1st February at 9.30pm.